for wider housework, such as kitchen cleaning, car washing and window cleaning. 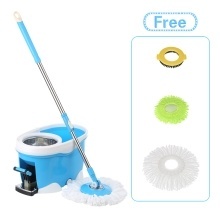 Why not own such a convenient spin mop to simplify your housework? Apply stainless steel and PP, sturdy and anti-rust. Effortless foot-pedal for self-dehydration, no more bending or wet hands. Telescopic mop handle with lock, non-slip to clean further places. Swivel joint can pivot 180°and rotate 360°,easy to reach corners, under furniture, other hard-to-reach places. Include 2 microfiber heads, can be used wet for removing stains or dry for dusting. Also include 1 * Scrub Brush to clean tile, kitchen and have 1 * chenille head to clean window or car and won&apos;t cause scratch. No water spilling out, suitable for tiles, wood/hardwood/laminate floors. Easy to assemble, space-saving to store. Package Size: 50 * 31 * 28cm / 19.68 * 12.2 * 11.02"